Danny Bettey entered the cage for the first time at Portsmouth Guildhall on Saturday. And he was involved in a thrilling amateur contest against Jacob Tribe at 140lbs. After three rounds of an action-packed battle, it was the 17-year-old who was awarded a unanimous-decision victory. The Southsea teenager has only been training for 18 months at Fratton’s Gym 01. But Bettey already spars with top professionals such as Cameron Hardy and Elliott Hoye on a consistent basis. Gareth Johnson regards his charge as a ‘very exciting’ talent. And although there’s still room for improvement, the Shock N Awe promoter was impressed by Bettey’s debut. Johnson said: ‘Danny Bettey against Jacob Tribe was absolutely incredible. ‘Jacob Tribe’s chin more than anything in the first round was so durable. ‘You only have to look at Danny’s style and look at how Cameron fights and realise who Danny looks up to. ‘His boxing style emulates Cameron. ‘Danny spars with Cameron, Elliot, Charlie (Riccard) on a rotation in the lighter weights. ‘You only have to look at those guys who are in and heading towards the pro ranks, put it all together in someone who is 17 and that’s how it all comes about. ‘He is very exciting. Danny started sparring when he was 15, just before his 16th birthday. 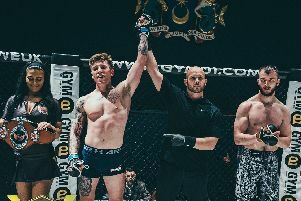 ‘He asked and we told him he couldn’t really, so he started with no headshots and grappling before progressing when he was 16. ‘Jacob Tribe has been training for a number of years, while Danny is only 18 months in.